You would imagine, given the many millions of hours that fishermen have spent staring at floats over all the aeons of time since the float was first invented, that there would a shelf load of books about them. 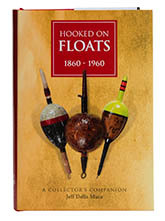 In fact, now I come to think about it, there ought to be more books about floats than there are on any other angling subject, with the possible exception of how to develop patience, but it simply ain’t the case. On the contrary, we are lucky to see a book on floats published once a decade, perhaps because floats are taken so completely for granted, but the good news is that if Jeff Della Mura’s book is the only one we are due to see this ten years, then it has been worth the wait. Hooked on Floats ticks all the boxes: it is 430 pages long; it is packed with colour; it is guaranteed to waste your entire day when you really should have been doing something else; and it is great fun. Jeff makes a heroic effort to stick to his subject, but every now and then his discipline breaks down with the result that he veers off into some other topic entirely, and the design has a similar tendency to kick its heels and rebel from time to time - which means that the general effect is like reading H.T. Sheringham on speed. I like the approach and it works well. This isn’t a history of the float - if you want that, you need to read Keith Harwood’s book The Float - but nonetheless Jeff covers the hundred years between 1860 and 1960 pretty well and adds plenty of useful information. That’s the good news. The bad news is that if you want to know everything about floats, the only way out now is to buy both Keith's and Jeff’s books, but then you were going to do that anyway, weren’t you? I had better give some idea of what the book is like. The first part of Hooked on Floats is a series of essays by float collectors, and while they are okay, the pieces have inevitable overlaps and just get totally blown away by the quality of the remainder of the book, which, as the author says, isn’t meant to be a complete survey of the period so much as a sampler of what was around at the time. The following chapters cover how to collect, care for and repair floats; the classic styles; world floats; and just about anything else that happens to catch Jeff’s eye, which was more than enough to keep me amused for several evenings in a row. Actually, he left me wanting another 400 pages, but maybe we will get that in volume 2. Should you buy it? Yeah, what are you waiting for? You think fifty quid is over the top? I swear, it is not - for some books, yes, but not for this one. Besides, unless you have been lucky enough to nail down one of the half bound leather copies, there are only 340 copies of the standard edition and once word gets out, they will be gone, and then you will kick yourself and you will deserve to hurt.